Daily Illuminator: Do You Dare Illuminate The Shadows? April 23, 2012: Do You Dare Illuminate The Shadows? You've got a rain-soaked trench coat, a crumpled fedora, and second-hand shoes with the soles so thin you can barely walk the razor's edge of your own morality. What else do you need? Your independent streak can only get you so far. Word on the street is you can use one more thing: Pyramid #3/42: Noir. This issue has tools and tips to help keep you alive as the dice fall on those shady gaming tables. There's a club (with map) crafted by Matt Riggsby (author of GURPS Locations: The Tower of Octavius). It's got professional insight and GURPS stats for bouncers and those who keep the peace as the liquor flows. It's rounded up the "usual suspects" of supporting-cast members and given them GURPS stats. It also has a den of iniquity, a way to gather solo-minded heroes, and an examination of one of the genre's biggest tropes. 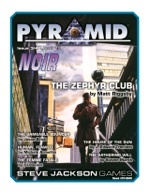 Whether you're looking to build a shadowy world of your own or to add some of the best gray-tinged elements to your existing campaign, Pyramid #3/42: Noir has what you need to double-down your life-debt, double-time your doll, or double-cross your boss. Pick up this issue, or subscribe today beginning with this issue. Don't be left in the dark!